I popped into Clarence's last week for a pre-Christmas drink with my mate Paige, and will certainly recommend that you check it out. Not only does it have a great tapas menu of reasonably filling and very tasty morsels, at a reasonable price, it also has a top shelf liquor selection to make any old liquor aficionado shed a tear of joy, and enough tasty chick-drinks (ie cocktails) to keep the girls happy! We ordered the deep fried school prawns, which came with a generous smear of light, creamy dipping sauce and a wedge of lemon. I will grant this the Samuel L. Jackson seal of approval - it's not a Big Kahuna Burger, but it's definitely TASTY. Speaking of which, there were plenty of tasty beverages to wash down the meal. 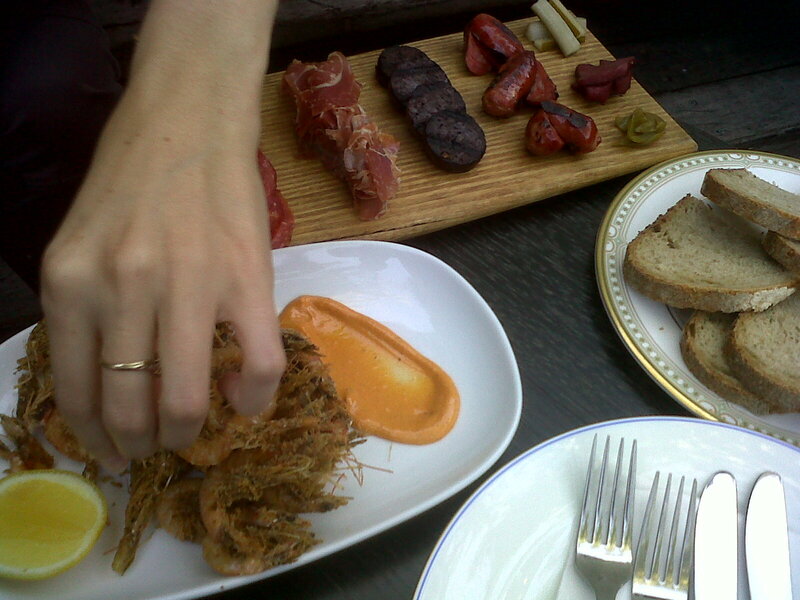 We also ordered the meat platter, which has a selection of four cured meats and 3 pickled vegie thingees. There was the thinly sliced rounds of salami-type things - probably coppa. Nice. And the slices of jamon. Also nice. Then there's the sliced blood sausage - very nice (although Paige would only try a tiny mouthful and refused to eat anymore - more for me I say). 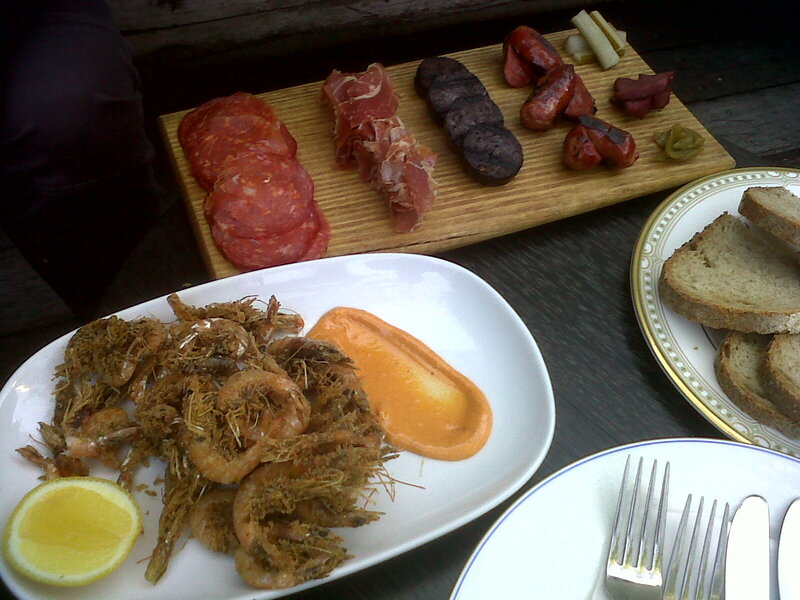 The lightly grilled chorizo was probably the one that we both agreed upon as the tastiest selection. As for the pickles - the wine-poached pears (at least I think they're pears - it's hard to tell when it doesn't look like a pear. Maybe apples? How do you like 'em apples?). The dishes also came with a generous serve of thick-sliced brown bread. A great idea is buttering up a bite-sized slice, then heaping a lump of jamon on it, balancing a blood sausage (or chorizo, as the case may be), then popping the whole thing in your mouth and enjoying the flavour combination. Now onto the tasty beverages. Paige of course went for the chick drinks. I can't remember too much of it - berries and suchlike, but she loved them. So if you're a chick, you'll dig it. I did remember the Aperol Sour, simply because it way my turn to buy - aperol, lemon juice and bitters. Very refreshing, and an interesting lurid orange colour to boot. Paige also had a good chat to the bartender chick, who was really into her art, and was chuffed that someone was keen to know more. For the blokes - interesting range of beers, included a draft cider, and also a draft Kirin Malt. Different indeed. But the real highlight is the top shelf liquor selection, which makes you feel like a kid in the candy shop (not the 50 Cent type, sadly). There was a selection of obscure looking rums, so I randomly picked the St James. It's a delicious sipping rum. Characteristic toasted caramel, slightly diluted molasses texture and a tart, alcoholic backbone. So good I made Paige get me another when it was her turn to buy. Of course, a meal is never the same without good company and conversation. Paige-o and I enjoy talking animatedly about everything and nothing in general (otherwise known as crap-talking, of which my best mate Brandon and I are trying to elevate to a truly sublime multi-faceted art-form). I highly recommend that you try it for fun one day soon. An easy one is to engage in people-watching and comment outrageously on the people around you. Hey - don't feel bad, they're probably making fun of you too! Another method is to bring up random incidents which happened to you recently. As long as you don't take it too seriously, and you keep the commentary interesting, it's usually a winner. A different level altogether, which I don't recommend for novice crap-talkers, is just to make something up and see how far you can run with it, and how much you can twist the conversation around to resemble nothing like what it started out. This advanced form of crap-talking can be very satisfying and enjoyable if you are proficient enough to keep it going for a good length of time - kinda like Venus and Serena Williams trading continuous volleys on the tennis court - it is a satisfying achievement regardless of who wins. As I said, definitely worth trying! I am certainly planning on going back to sample more of those obscure looking bottles on the top shelf, with or without crap-talking.